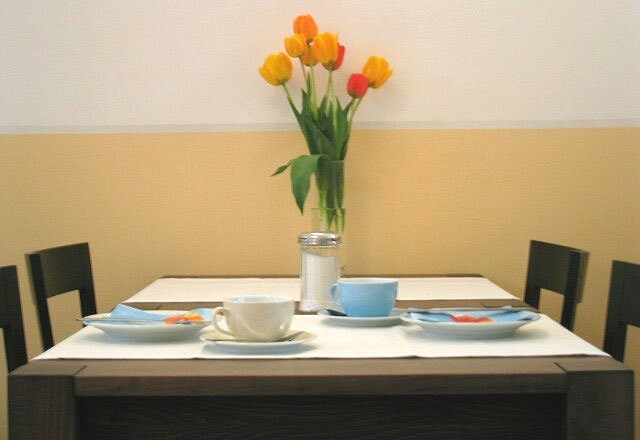 Pension am Helenenwall | ★ bed and breakfast, ★ quietly situated no-smoking-rooms, ★ in the centre of Cologne. We offer bed and breakfast. Our guest house is located in the city-center of Cologne in a silent area about 200 meters away from the river Rhine. The trade fair ground “Koelnmesse”, the multi-purpose arena “LANXESS arena” and the old town of Cologne with its sights, shops and nightlife are very near and can all be reached by walking or a short tram ride. We are offering non-smoking lodging since our opening in Arpil 2006. Until today we had many pleased guests from all continents. We are looking forward to welcome you as our guests as well. Besides accommodation in a modern, well-kept guestroom you can enjoy our breakfast-buffet in the morning. Our guests can connect to the internet by using our “freifunk.net” WiFi hotspot for free. A commercial WiFi service is also available for a moderate price. All our rooms are non-smoking rooms.